A series of workbooks offering integrated content and language support for specific subjects. Breakthrough to CLIL for Chemistry, Age 14-16 helps ESL/EAL students get the most out of their studies when learning subjects through the medium of English. 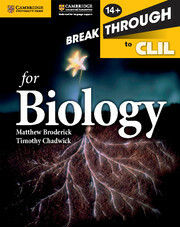 Designed to support any Chemistry curriculum for students aged 14-16, including UK GCSE, Cambridge IGCSE® and IB MYP, Breakthrough to CLIL for Chemistry should be used alongside a core textbook and may be used within the classroom or as a self-study or homework resource.Breakthrough to CLIL for Chemistry contains exercises set within the context of core topics to consolidate understanding, embedding practice in aspects of language central to the subject in question. 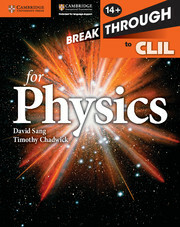 Endorsed by Cambridge International Examinations for language support to support the IGCSE® Chemistry syllabus. Helps students and teachers to feel confident in the product because it is approved by the exam board. 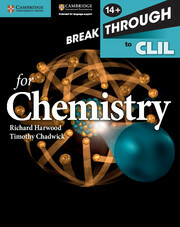 Supports any Chemistry curriculum for students aged 14-16. Language in context helps students to consolidate understanding of subject specific terminology.